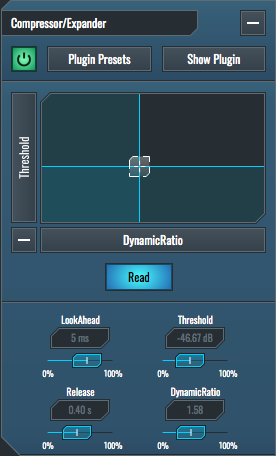 The Insert Rack Widget within the SoundBridge: DAW is another inevitable part of its interface. It is primarily used for loading effects and VST instruments. By using it, you can organize your VST presets for easier navigation, enable or disable automation of VST parameters and more. In the next tutorial, we will guide you through the Insert Rack Widget to help you understand its importance and different possibilities. The “Insert Rack” is located on right side of the SoundBridge: DAW window. Here you can see all of the rack modules on the selected track. On the top of the “Insert Rack” widget, you can see the “Remove Plugin” button. This button removes any of the selected rack modules. 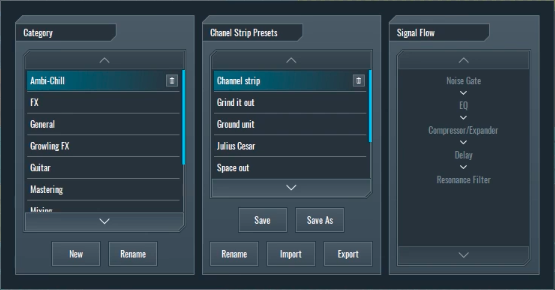 The “Channel Preset” button opens a dialogue which allows you to save or load entire channel stips of effects. The first part of the “Channel Preset” dialogue manages categories of presets. Here you can make new categories, rename or delete them. The middle part of this dialogue manages and displays all of the presets of the selected category. You can use this area to save presets, save them under a new name, rename them, import from a hard drive, export to hard drive or delete them. The third part of this dialogue displays the signal flow and all of the effects that the currently selected channel presets contains. You can load any of these channels presets by double-clicking them. Once loaded, all modules have some significant controls. The “Bypass” button, which bypasses the effect and can be fully automated, a “Collapse & Expand” button, so that you can easily see more of your effects chain. Furthermore, there is one more “Collapse & Expand” button which can be found a bit lower, and you can use it to show or hide the parameters read from the plugin. Finally, the “Show Plugin” button will open the plugins graphical user interface. To automate the parameters of the plugin, you can engage the “Read” button shown in the pictures above. Additionally, you can move the parameters of the plugin you want to “Read”. When done, disengage the “Read” button by clicking on it. All automatable parameters, moved within the plugin while its engaged will be automatically read. 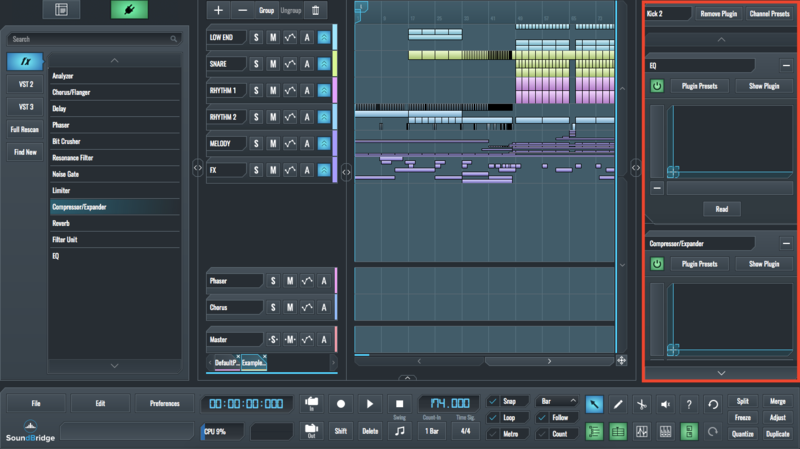 After that, the parameters are at your disposal for automation by using the “Automation Lane”, the “MIDI Mapping” in its dedicated section and also in dialogues of the plugins X/Y graphs. You can use the “X/Y graph’ to map two of the read parameters to the X and Y axis of the X/Y plane. This is very useful if you want to control two parameters simultaneously, especially on a touch-screen device. The “Plugin Presets” button opens up a dialogue which allows you to load or save the plugin presets. The first part of this dialogue manages the categories of these presets. Here you can make new categories, rename or delete them. The second part of this dialogues manages and displays all of the presets in the selected category; you can use this area to select presets, save them under a new name, rename, import from the hard drive, export to hard drive or delete them.